It is often said in the world of fashion that fashion is “evolutionary not revolutionary”. I agree with the statement that fashion is evolutionary but only from a design and silhouette standpoint. Today the industry is truly revolutionary from a textile standpoint. It is therefore my opinion that the statement as written needs to have a new chapter added where fashion becomes revolutionary and evolutionary at the same time with textiles leading that revolutionary. For those that have grown up in the fashion business where fiber choice was limited to several mainstays such as natural fibers like cotton, wool, linen and silk and the man-made fibers like polyester and nylon it is refreshing to see what is happening through the use of technology and innovation in fiber and textile development. It is not only a revolution in new fibers and fiber creation but there are exciting strides that have been made in the mainstays mentioned above that has excited fiber aficionados from around the world. Through the use of improved seed development to unique spinning, dyeing and finishing techniques the fibers and textiles of today are far more interesting than those of the past. Bolt Threads: “We believe that answers to our most vexing problems can be found in nature. Every day we’re inspired by the amazing materials we work with, and driven by the desire to turn these materials into incredible products that solve the problems of a resource-constrained world.” Bolt has developed the technology to replicate spider silk for commercial use and has a line of knit ties to prove it. Orange Fiber: “We are the world’s first and only brand to produce a patented material from citrus juice byproducts, repurposing them to create beautiful, sensorial materials that reshape your sartorial experience. Our fabrics are formed from silk-like cellulose yarn that can blend with other materials. When used in its purest form, the resulting 100% citrus textile features a soft and silky hand-feel and lightweight.” Textiles, food and Italian knowhow coming together to produce a truly unique fiber/fabric. AlgiKnit: Uses kelp, a type of seaweed, to produce a biopolymer called alginate which is then used for textile production. AlgiKnit produces a line of knitted sweaters form yarns developed by nature under water. Modern Meadow: A New Jersey-based company designs DNA that can yield collagen, the protein that makes up leather. These specially constructed DNA strands are inserted into yeast cells producing collagen and other proteins that are essential in forming leather. This process can be linked to lab grown leather like products. The tradename under which Modern meadow will be marketing their line of leather like products is Zoa. Mango Materials: Is a California start up that makes fabrics by feeding wastewater methane to methanotrophic bacteria that eat it and produce PHA-based polyester that can be woven into threads or molded into various shapes. Now that is truly revolutionary and a fine use of chemistry. This is only a snap shot of where we are today and no doubt many reading this are familiar with these companies and what they are capable of. The point of the piece is to show just how revolutionary the fashion industry has become and where the future is going. Given the emphasis on sustainable sourcing, materials creation, and our current dependence on fibers that use large quantities of natural resources such as oil and water the industry must embrace the revolution and find ways to make these and new innovations commercially viable. I believe this is only the beginning and through technology and imagination the revolution in textiles and fiber creation is in its infancy. Corporations are slowly realizing the impact of their business on the environment and society. They are also facing increasing pressure from their stakeholders to follow responsible business practices. Many companies are looking to incorporate and manage a sustainable business. However, they are unaware on where and how to start this transition. This book is written with the lens of the triple bottom line: people, planet, and profit. Dr. Jain’s argument that sustainability should be a fundamental value as well as a core business strategy that is financially sound and viable in the long run. This resonates with Will Marr’s claim that sustainability is good for business (CSRNotes, 2010). It is encouraging to learn that sustainability has become a “must have” agenda for most organizations. In one of my recent conversations with Target Corporation PD&D designers, the sustainability is a “must have” agenda too. This book has a potential to be a valuable resource for companies and professionals who have a direct job role to implement sustainability within the company/organization. Proposed steps are well supported by author’s first-hand experience. The book is divided in three focus areas-understanding sustainability, implementing sustainability, and managing and measuring sustainability. Author’s statement about a companies’ commitment to sustaining in all three Ps as an important attribute to be true to sustainability grabbed my attention. Until now I believed that if any corporation is engaged in the planet and people whether in a balanced or imbalanced way, it was a step toward sustainability. However, after reading this chapter, I am in agreement that all three Ps should be balanced for sustainability to bring the desired impact. The book refers to Mark Roseland’s community capital framework for sustainable development. It is a valuable model to understand the p-22: repetition regarding community capital. Some other concepts seem somewhat random. Organizational sustainability and sustainable organization are discussed separately and have not been operationalized for definition purpose. The organizational perspective has been introduced well, but certain concepts are still confusing. Conney (2009), green business criteria are listed which need further elaboration or may not be needed to be referenced. Principles of sustainability have been refereed several times- it would be helpful to list and define the principles? Or is the author referring to the triple bottom line. Sustainable business has been described, but it seems to ignore social dimension (p-28-30). The example on page 32-33 seems to be clearer. Then there is a reference to inward-facing sustainability program but inward and outward facing has not been delineated. It would be helpful to keep consistent terminology. Chapter 2 has valuable content but need to be streamlined. Increasing awareness and demand for sustainable products and services is listed as a challenge. I would recommend changing the word challenge to perhaps context. The chart of drivers and content describing those drivers should match. I would encourage you to revisit this chapter. Further, eco labels have been discussed and credibility mentioned. It might be helpful to discuss about company own eco labels vs. third party certifications and labels. The section on 3E’s: Efficient, Engaging, and Effective is well written. Those are powerful internal drivers to bring the desired change. In the example, the author bring a question regarding who should be involved- In my opinion, all employees should be involved. From high management to the entry level customer end retail front. The author has a good listing of steps. In simplified language would be to identify where is the supply chain and operations most environmental and social damage is happening. Then create a yearly goal of reducing it in steps. Example of Dystar is a great example of vision and mission, but the example of Reliance is not a good example as it is not very clear. Goals section is well done. I especially liked the statement that if senior management has established realistic goals for the organization, they are easier to accomplish. Example from the author’s workplace on page 66 also points to an important aspect-identify the right people or the trail blazers who value your sustainability goals and jump right on board. Realistic goals with suitable people, and engaging stakeholder within the context of the company and its environment. Great points. Materiality Analysis needs further explanation. How is it different than what has already been discussed. May be it is just a tool that can be used for the work discussed. In that case, it should be mentioned before starting the section. The aspects discussed on pages 72-75 are good but consider combining sustainable products and processes and life cycle assessments. The aspect of reporting can also include transparency to all stake holders. Chapter 3 focuses on measurement and reporting. The author advocates for GRI and hiring a sustainability manager. Smaller companies may not have resources to have a separate position. The section on labels would be benefited by some expansion. It is important to discuss company’s own eco labels and standards and third party certifications. I would like the author to consider labeling the figures and charts and refereeing them in the text for better readability and meaningful impact. Some statements are missing references which are important for credibility. Consistency in format is important. ​Overall, great resource. Thanks for sharing! 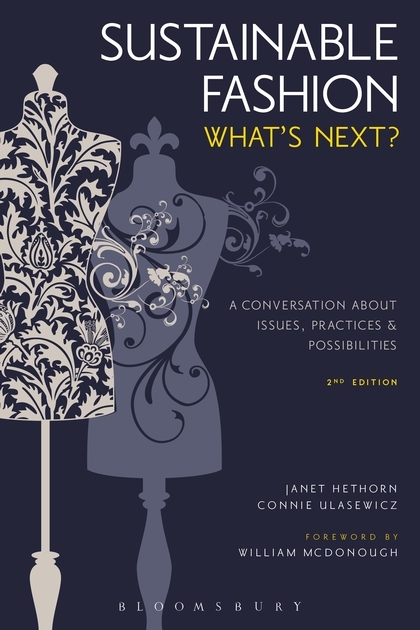 Sustainable Fashion: What’s Next is more than just an update from the authors’ first book, Sustainable Fashion: Why Now. The book continues to engage the reader in understanding and being a part of the issues and consequences that designers, marketers, and product developers face as they , “ rethink processes and generate new ideas to produce or reproduce garments with a sense of ethics, using appropriate resources and manufacturing them in humane conditions that together sustain the planet and its people” (pg. xxvii). For faculty, this version also poses discussion questions at the end of each of the 15 chapters to channel discussion and further inquiry. ​​With GUIDELINES II, the editors have successfully compiled a book that is formatted for a fashion-oriented audience – clearly demonstrating sensitivity to the visual impression of the text and layouts. Due to its thorough coverage of the fashion supply chain, which enables readers to grasp the complexities of achieving sustainability, this handbook is very appropriate for the fashion student as well as for the fashion professional seeking a deeper understanding of sustainable issues. The case studies presented throughout the book are representative of a diverse set of best practices among global apparel firms and displayed in a concise manner for the reader. These cases would also be suitable on their own as supplemental readings accompanying other course readings. Such a comprehensive set of sustainable fashion cases can be difficult to assemble using case study libraries that may focus on non-fashion related sustainability issues. The mapping of the cases also serves as a model for readers to conduct their own analysis and could be an excellent assignment for students to apply concepts to additional companies.I have referenced the text as I developed content for a new course and found it to be extremely valuable as a resource, particularly for its coverage of international organizations, standards, designers and fashion firms.